Providing you the best range of leather passcase wallets and men's leather passcase wallets with effective & timely delivery. 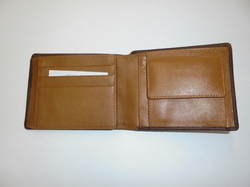 Description :This full grain leather wallet passcase holds all the basic features you desire. A fixed passcase on the left holds your id and credit cards. 8 credit card slots 1clear id/photo window 2 bill compartments 2 interior pockets “columbus” woven fabric lining inside complimented with reverse debossed “c” logo on the top. Description: A perfect passcase leather wallet with a removable passcase for the person who carries a variety of credit cards and business cards. Leather made in Italy 8 Credit card slots 2 Bill compartments 2 Interior Pockets “Columbus” woven fabric lining inside Complimented with reverse debossed “C” logo on the top. Looking for Leather Passcase Wallets ?